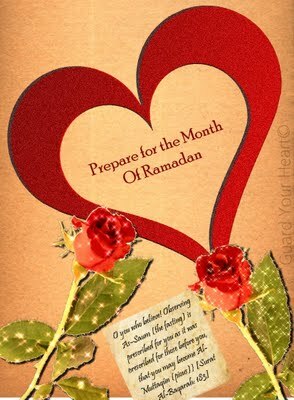 Ramadan, the blessed month is about to come. It is time to improve the self; Ramadan is the month which puts us in a situation that we must act rightly so that our fasting would be accepted by Allah (swt). This is why we are more serious when the blessed month of mercy arrives. But before we start preparing for the month of Ramadan we must allow ourselves to continue an act that we have done in Ramadan, at least one or two to carry this characteristic within you. The month of Ramadan is a chance to purify yourself from the ills that you may have done, it is a chance to carry this gift of Dhikr till the day you die! Some people spend their Ramadan sleeping and eating too much…That’s soo sad, wasting all this blessed time with food, tv, sleeping! That’s a shame and a waste! We should take this as a chance of asking Allah (swt) for forgiveness. But not only do some people eat and sleep too much, they also just pray in Ramadan, or decide to pray only on Fridays, till Ramadan has passed , you would see some forgetting the importance of the Ibadaah instead of continuing it. May Allah (swt) forgive us all, Ameen. First and foremost, Niyah matters. Intention plays an important part in our lives as you will have this tendency to do this act for the sake of Allah (swt) seeking his pleasure alone and not for anyone else. Before any preparation, let’s make this sincere intention to Allah (swt), let's achieve Ikhlas (sincerity, being true with Allah (subhana wa ta'ala and seeking his pleasure alone), let’s plan but never expect that the next day you will be alive. Spend a time at night alone when no-one would see you to prepare for the month of Ramadan, make Dua (supplication) so the light of humbleness will enter your heart. Remember that Allah (swt) bestows his grace to whomever he wills. Seek Allah’s grace by trying to start tomorrow with remembering Allah (swt). When you eat, remember that Allah (swt) has given this food so that we can satisfy our hunger. When you drink, remember that Allah (swt) has given us this drink to quench our thirst. In many things you can praise your Lord! So, in every deed that you have done would be with sincerity because of your remembrance of Allah (swt). Indeed, Allah (swt) knows what’s in the hearts of mankind.